Conservative talk show host and writer Ben Shapiro spoke about his views on "radical" feminism on Monday in Slee Hall. Conservative talk show host, writer and political commentator Ben Shapiro delivered a fact-filled, humorous speech to roughly 670 people on Monday night. Shapiro spoke to a sold-out crowd at Slee Hall and focused his discussion on radical feminism and current viewpoints on marriage, sexual relationships and abortion. The Young America’s Foundation, a nonprofit organization for conservative youth, paid Shapiro to speak on North Campus, as part of the organization’s Fred Allen Lecture Series. UB’s Young Americans for Freedom chapter presented the event. Shapiro spoke for roughly 40 minutes and ended the evening with a 30-minute Q&A session. Audience members’ questions ranged from topics such as Shapiro’s tweets about the Middle East, how to civically engage with liberals, Colin Kaepernick and abortion. Compared to previous YAF events, like self-proclaimed “radical Islam expert” Robert Spencer’s event two years ago, audience members acted peacefully and did not disrupt Shapiro’s talk. UPD and security outlined the theater in case any students shouted or threw anything towards the speaker. 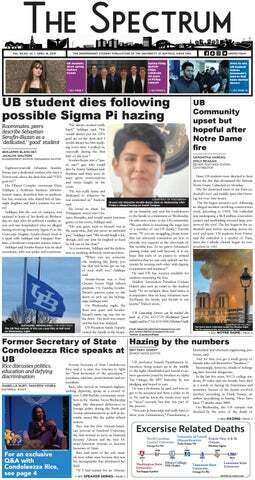 UB’s YAF chapter president Mike Powers said no matter who comes to campus, “Ben Shapiro or not,” it’s important for the UB community to give them support. “You need to do your job as a human being, and that is to help the people to the left and the right of you,” Powers said. The event went off “without a hitch” in terms of safety, according to UPD Deputy Chief Joshua Sticht. “The only problem really was there were so many more people that wanted to get in [Slee Hall] from outside that couldn’t. As far as problems go that’s the kind you want to have with an event like this,” Sticht said. An hour and a half before the event, roughly 100 people lined up in the Student Union to pick up unclaimed tickets for the event. Prior to Shapiro’s talk, security allowed a few members of the community waiting outside the concert hall into the event to fill remaining empty seats. Senior Associate Vice President for Student Life Barb Ricotta kicked things off with a video featuring members of the UB community talking about freedom of expression. Shapiro entered to a standing ovation, and then reminisced about watching Jim Kelly’s Buffalo Bills and his first trip to Buffalo from California 11 years ago to see a snowy Niagara Falls. He jumped straight into a discussion of the sexes and the recent confirmation of Supreme Court Justice Brett Kavanaugh. Shapiro said feminism has been radicalized, taking a “disgraceful departure” from its origins. He calls himself an “original feminist” and said he supports women’s rights, but values traditional relationship roles and marriages. Students appreciated the opportunity to see the speaker express his viewpoints and directly ask him questions, which often turned into full-length conversations. Andy Kowalczyk, a freshman philosophy and political science major, asked Shapiro a question during the Q&A. He told Shapiro that he’s liberal and then asked about the conservative’s thoughts on Alex Jones being banned from social media and NFL players kneeling during the anthem. Kowalczyk appreciated that even though Shapiro has different political views, he still entertained his ideas and had an in-depth conversation on the issues. Matthew O’Connor, a junior mechanical aerospace engineering major, said he didn’t expect students to ask Shapiro such thought-provoking questions. He appreciates that UB can have speakers like Shapiro come to campus, talk about their viewpoints and interact with students in such an intimate setting. Benjamin Blanchet and Max Kalnitz are editors and can be reached at benjamin.blanchet@ubspectrum.com and max.kalnitz@ubspectrum.com. Follow them on Twitter @BenjaminUBSpec and @Max_Kalnitz.